I tried using Gmail to check another Gmail account using POP3. The, I got email notification from them. 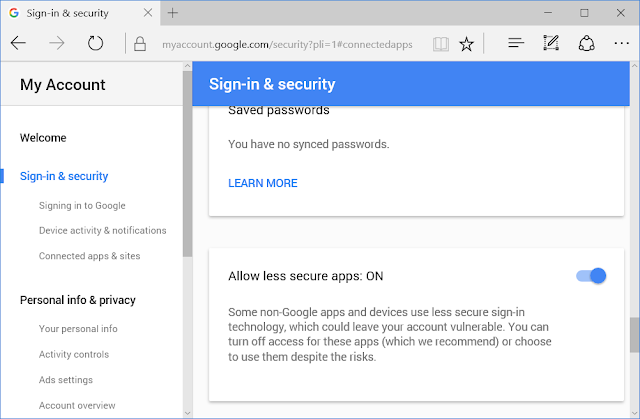 Someone just tried to sign in to your Google Account from an app that doesn't meet modern security standards. We strongly recommend that you use a secure app, like Gmail, to access your account. All apps made by Google meet these security standards. Using a less secure app, on the other hand, could leave your account vulnerable. The solution is just simple, that is by "Allow less secure apps: ON". They said that some non-Google apps and devices use less secure sign-in technology, which could leave your account vulnerable. You can turn off access for these apps (which we recommend) or choose to use them despite the risks.